Casa de los Canónigos o Casa dels Canonges (Canons' House) at Bisbe Irurita street and next to Sant Jaume square is a XIV c. Gothic building restored in the 1920s by Rubió i Bellver and Jeroni Martorell. 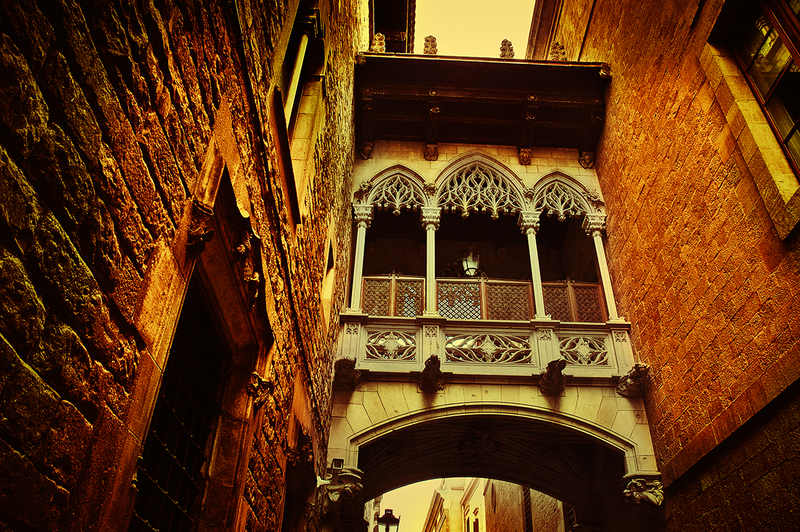 It was then that neogothic elements were added to the original building like this bridge connecting Palau de la Generalitat premises with the above mentioned religious house that until 1980 used to be the Official Residence of the President of La Generalitat. Jordi Pujol, the first elected Catalan government president after the 1978 Constitution discarded the house as private residence and so have done his successors. A ponte dá aos edifícios um toque extra! Breathtaking! I am in awe of this photo. It truly sparkles. Ok. . .I could live in a city if it were in an area like this in Barcelona. What an awesome photo! Such great lighting. I love checking your blog and reminiscing about beautiful Barcelona. I'm from the USA but lived in Barc from '94-'96 as a missionary. Thanks for posting all your great pics! Love the colors---so rich and vibrant!